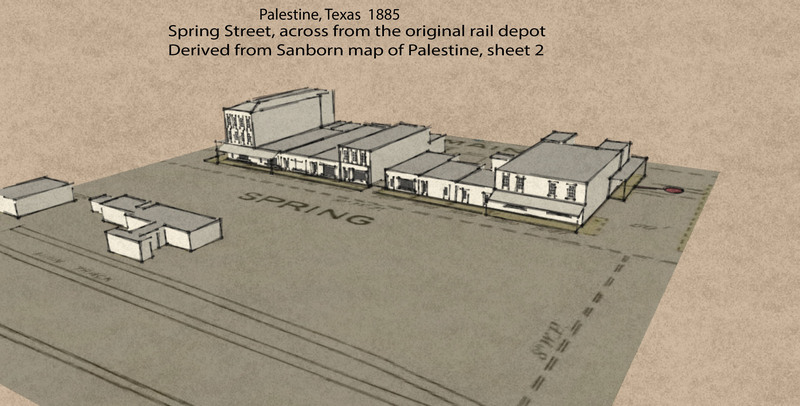 This week’s assignment was to use SketchUp to draw a building or a short block of buildings based off a Sanborn map. The results posted here took two solid days of work; I certainly have a much better appreciation for the knowledge and experience reflected in my earlier SketchUp link love. 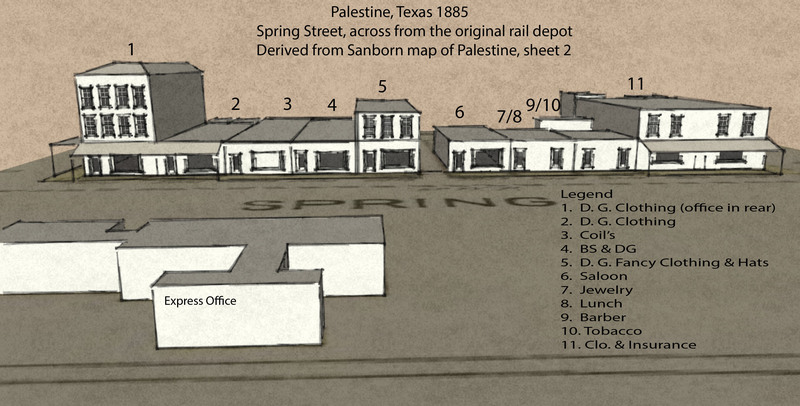 I pulled up the Sanborn fire insurance maps of Palestine, Texas in 1885 and decided to focus on a particular block across from the original railroad depot. After a few false starts, the software finally “clicked” enough with me to start building the final model. This view gives a good perspective on the spatial relationship of these particular businesses to the depot. When the International Great Northern railroad was established through the town in 1872, the land around the tracks built up in “new town” to provide services to the railroad and its employees. (Palestine’s population in 1848 was 210; by the 1890’s, it was over 6000.) The businesses depicted here in 1885 were on highly desirable land, likely drawing high rents and a lot of traffic. D. G. Hughes occupied three lots in this block, including a fancy 3-story with a French roof. (Update: I’m still not an expert on Sanborn map notations. D.G. is a Sanborn annotation for “dry goods.” The stores are likely three different businesses, with Hughes being the largest.) I wonder if the business served as a warehouse for mail-order or as an early department store. A visitor to this block could get a haircut, tobacco, lunch and/or a drink, a new hat and pants, and a perhaps a trinket for his lover — all without leaving sight of the Express Office and passenger station (not on the cropped map section) across the street. Note that an alley bisects the block to reach the next street. The French roof on the building at far left is constructed according to the depiction on the Sanborn map. It shows an odd jog at the rear, for which I have no explanation. There are three shed roofs extending out from each side and the rear of the block. 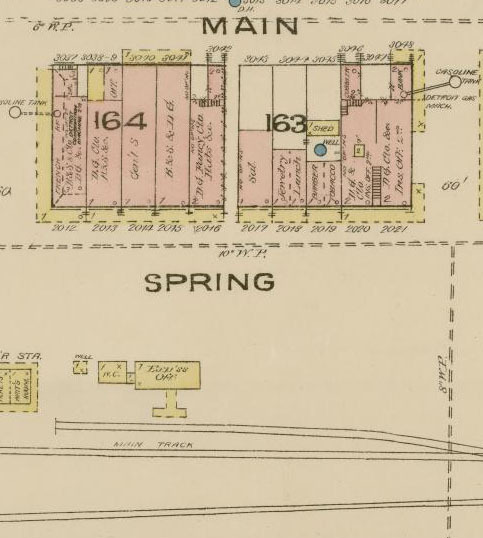 The shed roofs at each side appear to be protecting a “Detroit Gasoline Machine” notated in each location, with further notations indicating the location of buried gas lines and tanks. What the heck is a Gasoline Machine? The answer, I believe, is that these machines were engines that powered either streetlights or interior lighting for the business district. 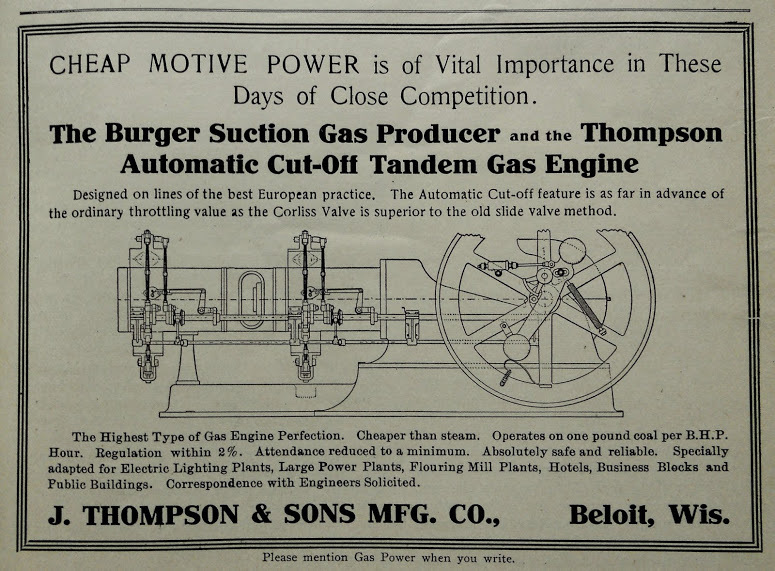 There are no other such engines noted on the Sanborn sheet for this district. Were they safe? That’s a relative question – it was safer than kerosene. Just for fun, I took a look at the 1891 Sanborn map. 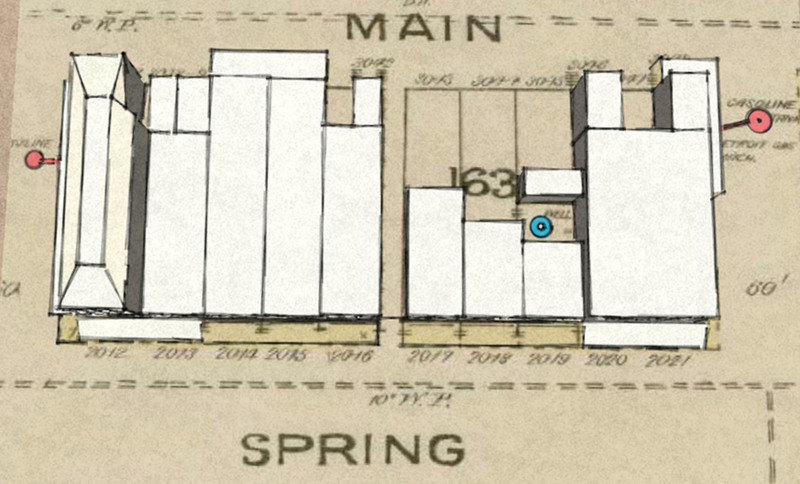 The block is mostly blank, with a three buildings that do not match the original map. The gasoline machines and the tanks are no longer notated. What happened? Did the machines, catch fire and burn down the entire block? 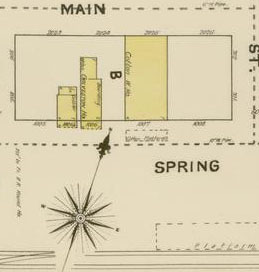 If my interpretation is correct, the fire may have spread to multiple blocks, explaining gaps in adjacent blocks on the 1896 map. This is all just speculation, of course, but it’s hard to imagine how (or why) else an entire city block in a highly-prized area of town could be razed. The answer, I suppose, is in the archives of the local newspaper or historical society. Update: I commented on April’s post about the frustrations of matching census data to Sanborn maps.